Space-age future and prehistoric past collide when the colony ship Esmeralda crashes on Tyson III, a planet home to creatures long extinct on our own planet. A young child, Robin, is a survivor of this crash, and finds himself all alone on the hostile planet. Together with his adoptive pet Tyrannosaur and floating HIGS AI unit, Robin must venture into the deep unknown to uncover hidden truths about the planet and his crashed ship. It’s inspired by the classic tale of Robinson Crusoe, albeit with a lot more artificial intelligence and dinosaurs this go around. VR is an exceptionally unique medium, with the ability to transport players directly into the environment and the story, though development of these experiences is fraught with its own unique set of challenges, not the least of which is player comfort. So far we’ve seen a lot of VR applications that may be better termed “experiences” than “games,” short term being better suited to ease players in to the new sensation of virtual reality gaming. These experiences also tend to be stationary in nature, with movement handled in novel ways, most commonly a point-to-point teleport mechanic. 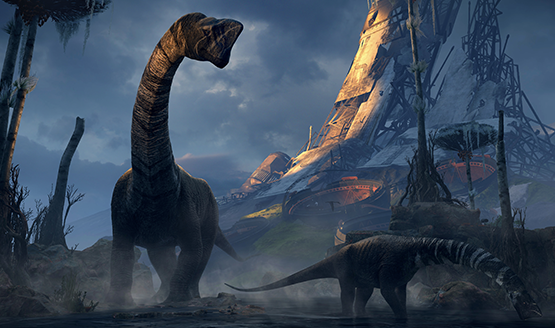 Robinson: The Journey bucks that trend by presenting a longer adventure with full environmental movement, a must for exploring the grand prehistoric world of Tyson III. The whole thing lasts around four hours from start to finish, though mileage may vary depending on puzzle proficiency and the general distraction of world exploration. Things start off simple enough, with some puzzles fixing up parts of the area Robin has setup as his living quarters and playing with Laika, Robin’s pet T-Rex, but quickly escalate to a grand scale, walking among giants. Dinosaurs have always been fascinating to me. I’ve been getting tired of the zombie craze lately, wishing that dinosaurs would make a prominent return to media, and Robinson gives plenty of reasons why these massive creatures are captivating, eliciting a desire to get close as much as there is a nagging feeling to run in the other direction. There’s an incredible sense of wonder as a long neck dinosaur leans in close to graze on a nearby plant. 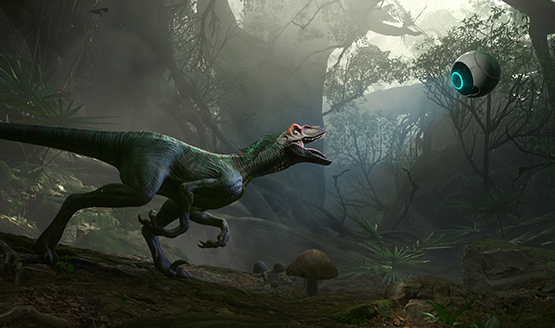 There’s a heart-sinking feeling of terror as a raptor leaps up from below looking to make you its next dinner. Remember the first time watching Jurassic Park? Much of Robinson offers that same impression. In fact there are even a couple of scenarios trying to avoid raptors that remind me a lot of that classic dinosaur movie. The tension is palpable as failure results in an up close encounter with these terrifying beasts. A shriek and the checkpoint is reloaded to do it all over again. These unforgiving checkpoints do present a hindrance to exploration and advancement across Tyson III. I wandered around, scanning the creatures roaming the planet, and later found myself missing a handhold while climbing. That death reset not only my position in the world, but also erased any progress I had made since the last checkpoint. Robinson is a relatively slow moving game to help mitigate any VR sickness, so coming upon any tricky sections can be quite frustrating as death resets progress again and again. Eventually I stopped bothering to scan much at all, because taking the time to scan an entire long neck or carefully scan a raptor without being seen wasn’t worth it when a precarious challenge led to my death again and again. Player comfort should be a perennial focus of VR development, and there is a fine balance between immersion and amenity. Robinson: The Journey is a seamless experience with free movement that can be played from beginning to end without obvious breaks. The longer I played, the more uneasy I would feel after taking off the headset. Robinson itself never made me feel ill while playing it, but there was a lasting disquiet in my stomach and head that persisted for beyond each session. It’s hard to say how much of this is based my own tolerance for VR at this point, but there’s always the possibility that an immunity to this unease could be built up over time, or that it doesn’t even manifest for some. It’s weird to fault a game for its exceptional immersion, but I really wish the game had implemented more obviously easy places to take a break. Instead I lost track of time playing with Laika, sneaking around raptors, and learning to live in this prehistoric world. There are comfort options in the settings that impact movement through the environment, but it’s not entirely obvious what each setting does and how it helps to allay in discomfort while playing. An explanation of these settings would go a long way towards ensuring that each player is as comfortable as possible while playing. Robinson: The Journey is played entirely with the DualShock 4, with things like climbing being relegated to the triggers. While it takes away some of the immersion that could have come from using the Move controllers, it’s realistically the only way to do entirely free movement in the game. Crytek is reportedly looking at Move compatibility, but enabling the Move controllers would require a whole different way to move through the environment, which is probably why the option isn’t available at launch, if it ever comes at all. It’s not only the best looking game on VR, but one of the longest virtual reality experiences we have so far. Robinson: The Journey pushes the envelope on the possibilities that PlayStation VR can provide for immersive narrative adventures. When seeking to break boundaries, there are some things that are bound to not work out perfectly as unexplored territory is charted for the first time, and these boundary breakers pave the way for the future of the tech. 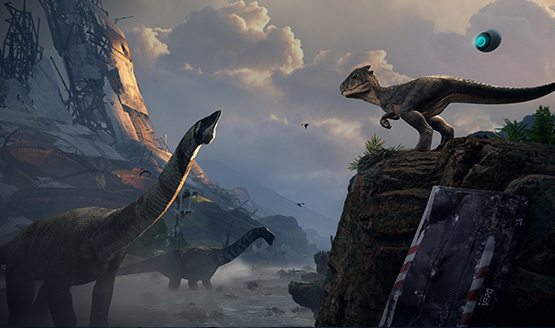 Robinson provides an incredible adventure that meshes the future with the past and allows players to walk among prehistoric greats in an immersive experience unlike any other on the platform. Sony’s got a real feather in their cap with this PlayStation VR exclusive, just remember to take breaks for the sake of your head and stomach. Robinson The Journey review code provided by publisher. Reviewed on PS4. For more information on scoring please see our Review Policy.